Alfie is one of my favourite people ever. Look, he’s even got his own website. I remember him vividly from my childhood but considering his age I probably read him more to my sister. Now, often sat in the garden watching my urchins grubbing around in the mud, poking ants and making rose petal perfume it’s as though a Shirley Hughes page has come to life. Her illustrations feel so familiar and right. There’s a reason picture books become classics. Because they hold eternal truths. Bits of Alfie’s messy, chaotic, love filled childhood are very similar to mine. Full of wicker, messy play, finger painting, earthenware, teapots, jam-jars of dandelions and homemade whole-wheat (nobbley as Alice and I called it) bread. My mum and dad had hardly any money but always plenty of time for us and they were pretty relaxed about mud, climbing, sharp knives, tool use and den building. Not all of my childhood was idyllic and flicking through these picture books today I remembered how important it is to celebrate all the good stuff as well. It warms my heart that Zeph loved Alfie as much as I do and he’s already a favourite of Ida’s – who yearns to get in first – we don’t have latch locks so – good luck – although I caught her trying to turn a key yesterday – uh oh. 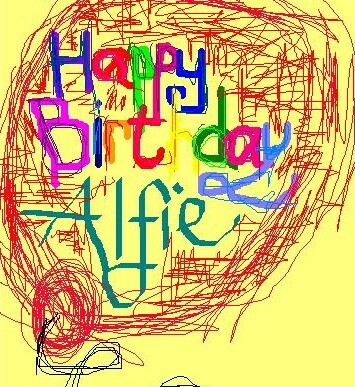 Happy Birthday Alfie and I’ll be drinking to another thirty years as soon as I’ve packed the kids off to bed. This entry was posted in Books, Uncategorized and tagged books, children, happiness, parenting, Shirley Hughes. Bookmark the permalink. I absolutely love Shirley Hughes. Love what you say about eternal truths. It reminds me so much of my childhood. So few books seems to paint really down to earth pictures of parenting like Hughes does. I know exactly what you mean – not that I don’t love a good magical other worldly experience. Last night I was thinking that these books do what I’m trying to – in that they see the beauty and magic in the everday and mundane, the stones and left over toast crumbs, spilt crayons and mucky faces. At the library last week I was enraged by the princess, shopping bias in the picture books. Also dismayed to see the new librarian has sorted a box of girls books and a box of boys. Sad days….